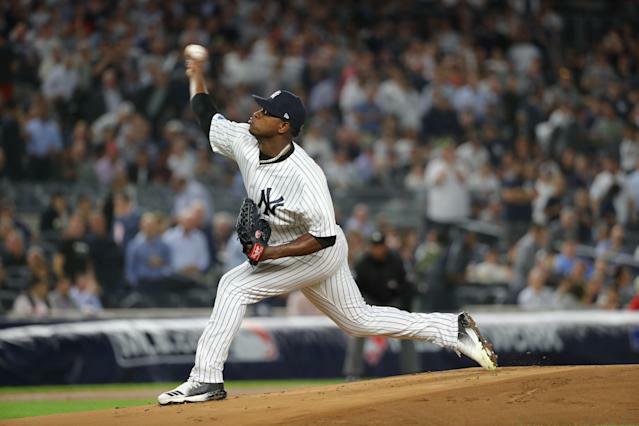 New York Yankees ace Luis Severino started the season on the injured list with lingering inflammation in his right shoulder. Expected to be sidelined until May at the earliest, Severino may not be moving closer to a return to action. Manager Aaron Boone told reporters Monday that Severino “didn’t feel great” after his latest long toss session and will return to New York from the team’s trip to Houston to see team doctors and have an MRI on his shoulder. Severino finished ninth in AL Cy Young voting last season after posting a 3.39 ERA with 220 strikeouts and 46 walks over 191.1 innings. He finished third in Cy Young voting the year prior with a 2.98 ERA, 230 strikeouts and 51 walks over 193.1 innings. He was scheduled as the Yankees opening day starter this season before the shoulder inflammation forced a change of plans.